Winner to be announced during the 2nd week of January. Prize is not transferable, and may not be exchanged for cash. This prize excludes flights, insurance, visas, transport. Also excluding transport to and from the airport and spending money, these are for the winner’s own account. 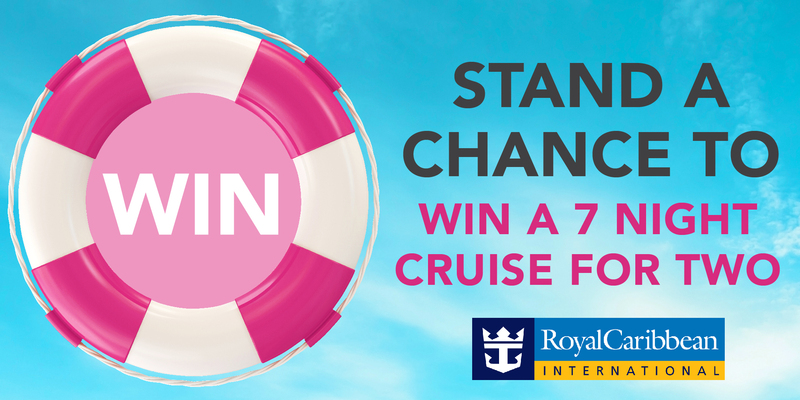 The prize is valid for two people sharing an inside stateroom on-board Royal Caribbean’s Symphony of the Seas in the Mediterranean, in 2018. The prize includes meals, activities and entertainment on board. The prize is based on minimum grade accommodation and includes port charges, fees and taxes, gratuities. The prize is for a specific sail date: 26 August 2018. The prize cannot be changed for an alternate date. to offer the prize to the next available candidate. Peak season surcharges and block out dates apply. Cruises International’s decision is final. The cruise prize must be redeemed by 31 Jan 2018. Competition only valid with the purchase of any Sorbet Smoothie treatment & the purchase of a Sorbet product at Sorbet DryBars only. Smoothie treatments must be purchased, not only booked from the 1st October – 31 October 2017. Entrants must be a Sorbet Loyalty Member to qualify. If the offer is not taken up by the expiry date, the offer will be forfeited and Sorbet shall have no obligation to refund any monies in lieu of the un-utilized prize. Winner will be drawn randomly and the draw will take during the second week of January 2018. The decision is final, no correspondence in this regard will be entered into. Winners will be notified telephonically and via email. If the winner cannot be contacted telephonically for a period of 3 days after the draw, the prize will be forfeited to a new winner that will be chosen randomly. The winner will be required to take part in publicity and participation in the competition is conditional upon agreement to take part in such publicity. Participants will not be entitled to any payment or other remuneration for any such publicity or otherwise. The winner will be required to provide Sorbet Salons with proof of identification in the form of a copy of his/her identity document, passport or South African driver’s license. All and any materials, including publicity materials, will be the sole property of Sorbet Group. Sorbet Group reserve the right to terminate, temporarily suspend or amend this promotion in the event of any unforeseen circumstances outside their reasonable control or technical or other difficulties that might compromise its integrity. Neither Sorbet Group nor their respective advertising, media and PR agencies, nor their trading partners shall be liable in any way whatsoever for any loss, damage or costs, howsoever arising, suffered by an entrant of this prize draw and/or participant in the prize offered. By entering the Sorbet Smoothie competition – All participants agree to the above terms and conditions. All participants who meet the eligibility requirements set out above will be automatically entered into the competition. SORBET RESERVES THE RIGHT TO TERMINATE, SUSPEND OR AMEND THE COMPETITION FOR REASONS BEYOND ITS CONTROL INCLUDING ITS SERVICES PROVIDERS AND ANY TELEPHONE NETWORK PROVIDERS, ARE NOT RESPONSIBLE FOR INCORRECT OR INACCURATE TRANSCRIPTION OF ENTRY INFORMATION, TECHNICAL MALFUNCTION, LOST OR DELAYED DATA TRANSMISSION, OMISSION, INTERRUPTION, DELETION, LINE FAILURE OR MALFUNCTION OF ANY TELEPHONE NETWORK, COMPUTER EQUIPMENT OR SOFTWARE, THE INABILITY TO ACCESS ANY WEBSITE OR ONLINE SERVICES OR FOR ANY OTHER REASON BEYOND ITS CONTROL.